More boats and exhibits expected for year two under new ownership. Boat dealers such as Sun Country will have models from major builders on display at the Los Angeles Boat Show. Activities for kids and adults will ensure nobody gets bored. For 62 years The Los Angeles Boat Show has attracted the boating crowd from Southern California and beyond, and for the second year the venerable show is under the management of the Duncan McIntosh Co. Inc., the producer of the Newport Boat Show, the Southern California Boat Show, the Fred Hall Shows and the San Diego Boat Show. 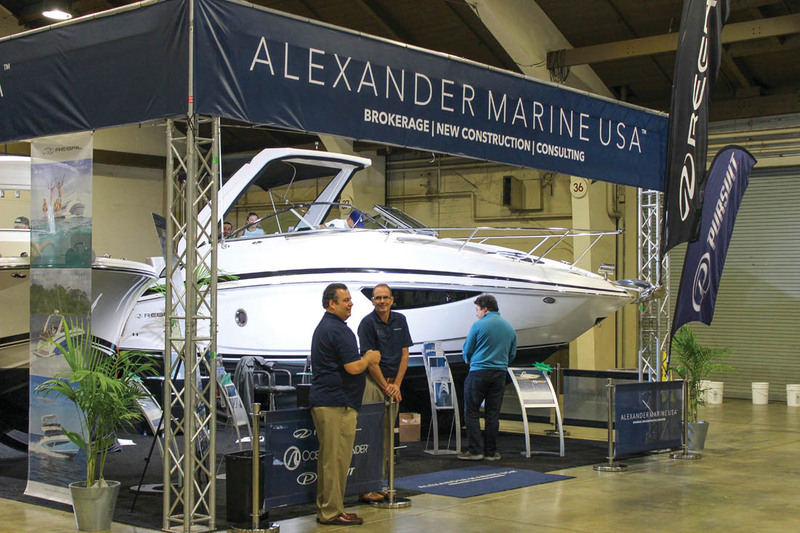 The 2018 show will also mark the second time the LA Boat Show will be held at the Fairplex in Pomona, Calif.
Last year’s inaugural run under DMC exceeded organizers’ expectations — especially given that three of the four days saw record rainfall — in both the quality and quantity of attendees. 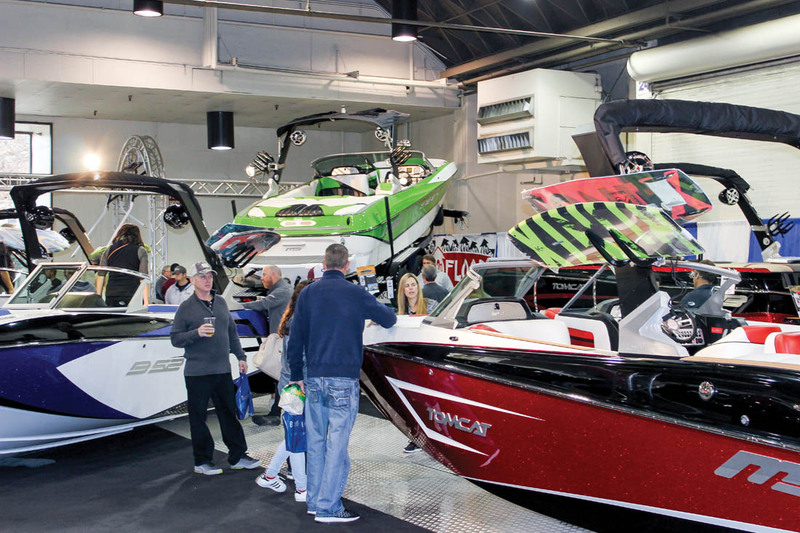 Sun Country Marine reported a 400 percent increase in sales, and other exhibitors had similar stories, thanks to new models in every category from builders who are gaining confidence. 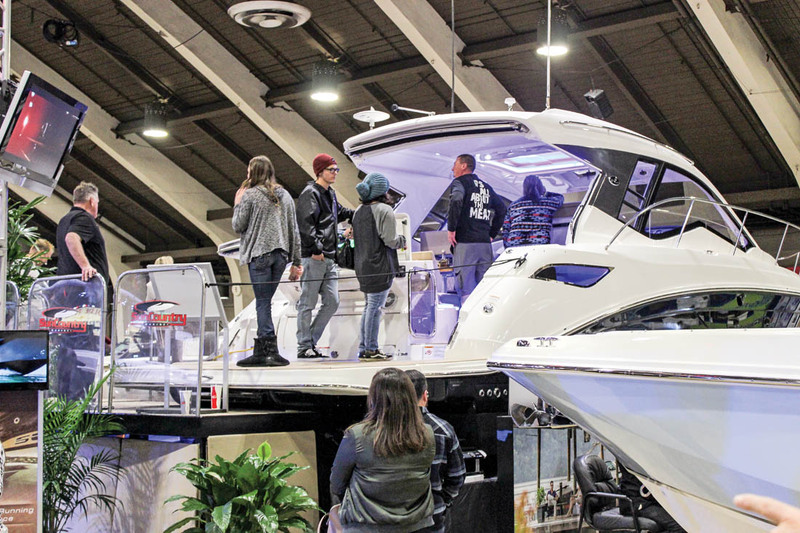 Whether you’re looking for a Malibu wakeboat (above) or a Regal weekender — or practically any other kind of trailerable boat — the Los Angeles Boat Show will have a model or 10 to look at and climb through. 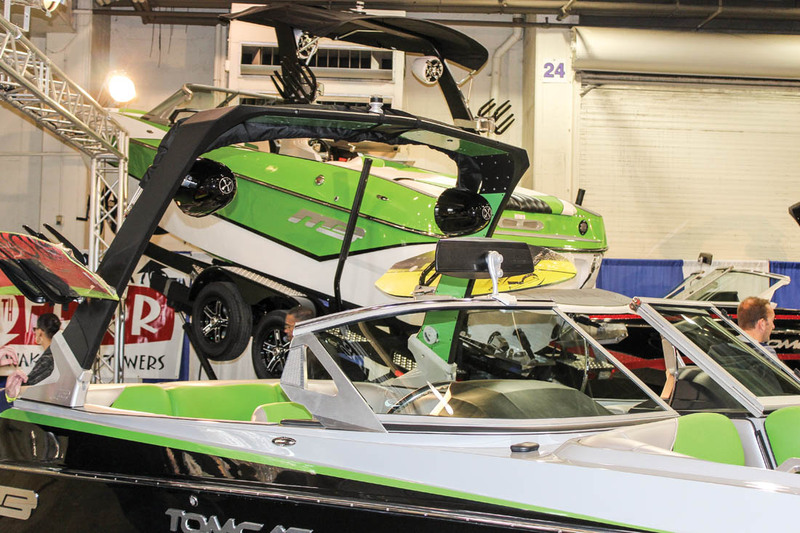 Attendees of this year’s show, which will cover more than 300,000 square feet, can expect to see new offerings from wakeboat manufacturers such as Centurion, Tige, Malibu, Nautique, Cobalt, MasterCraft, Sea Ray and others. Innovation in the wakeboat space has yielded such wake-specific technology as new tabs, “gates,” rudders and plates that plow up huge wakes for surfing and launching. And a couple of manufacturers even have wrist-worn systems that allow surfers to control the wake size and switch it to the other side of the boat. But the “cool” boats aren’t the only ones enjoying a new-model heyday. Pontoon manufacturers such as Bennington, Qwest, Crest, South Bay, Premier and Manitou are taking their boats to extremes, both in performance and comfort. With features such as outboards up to 400 hp, bars and galleys, slides, luxury seating and color schemes that will attract attention from across the lake, pontoon boats are part of the mainstream. Of course, fans of deckboats, bowriders, fishing boats, cuddy cabin boats, center consoles, cruisers and every other style will find plenty to ooh and aah over, from all the best builders, including boats up to nearly 40 feet. In addition, exhibitors will have the accessories, gear, equipment, electronics, soft goods, watersports paraphernalia, fishing gear and everything else a boat owner needs to outfit a vessel. Kids will enjoy walking around the show, riding the carousel and climbing around on the boats with their face painted by one of the artists at the show, and if mom or dad needs a break, a band will be providing entertainment Saturday and Sunday. The Fairplex area around the show has a couple of restaurants, and on the Saturday and Sunday of the show, in a building next to the boat show, is the Retro City Festival, which is a celebration of the history of video gaming — a fun distraction from an already fun distraction. January 18 | Noon–8 p.m.
January 19 | 10 a.m.–8 p.m.
January 20 | 10 a.m.–8 p.m.
January 21 | 10 a.m.–6 p.m.
To find out more and to buy tickets online, visit LosAngelesBoatShow.com.